Residential fencing is available in many different materials, including vinyl, wood, aluminum, iron and chain link. Based on the function of your fence, certain materials from that list might work very well or not at all, so it is important to begin by selecting your core fencing purpose. Perhaps you are trying to boost your property value, increase privacy, or keep your children and pets contained. A short white picket fence made from wood or vinyl will look beautiful and boost property value, but won’t help you contain your dogs. 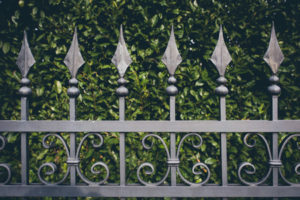 An ornamental iron fence, on the other hand, will look beautiful but do very little to give you more privacy. Once you identify your purpose, you can work with your fence company to determine the best materials to match. Fences can run between $2,000 and $8,000, so if you need to keep your project within a specific budget, be aware of that going in. Wood, for example, might only run $10 per foot installed, while vinyl will cost you up to $60 per foot installed. Blending your budgetary needs with your design vision is an important part of choosing your fence. In addition to purpose and budget, you also need to decide just how much maintenance you are willing to devote to your fence. Materials like wood, while cheaper, require more significant maintenance since they are subject to rotting and wear and tear. Vinyl and aluminum, on the other hand, are incredibly durable materials that only require your attention briefly each year. It’s all about balancing your priorities! For more help selecting the best fence for your backyard, give West Florida Fence in Tampa a call at (813) 251-5883. West Florida Fence has been serving the Tampa area since 1996 to design and install fences an unmatched combination of style, durability, and functionality. Whatever your backyard needs may be, West Florida Fence can make them happen.